In need of a comfortable stadium seat cushion for all of your favorite high school, college, and professional athletic events? The mega fit seat cushion is just for you! 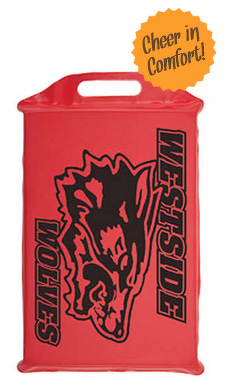 This high quality cushion doubles as an effective promotional product as well. Your seat cushion design is as unique as your idea, or ours! Imprint your favorite sporting team's logo or imprint your business's logo, message, and contact information for marketing purposes. Please specify imprint position when ordering. The handle can be at the top, bottom or either side. One or two sided imprints available. Designed for 13" x 14" mega fit seat cushions and made with our high quality, ¾" thick closed cell foam material. * Key Float handle is left in cushion. Print 1 line of straight-line copy only at no additional charge. Great for web address or phone #. If no copy is indicated, will be left blank. Chains not attached. Imprint Area: 9.5" x 10.5"